Luckily, this morning started off much better than the past few days, weather wise. The rain said adios and the wind made a 360, blowing out of the southwest. Seas were finally calm offshore and the sun was shining bright, which makes for a very pleasant fishing charter in Fort Lauderdale. 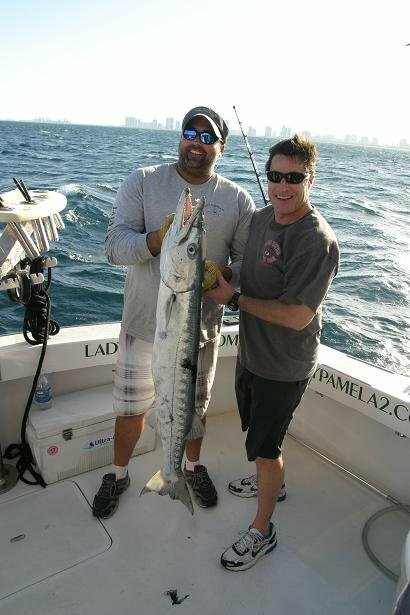 Bob Gatesy joined Captain Paul and me for another fishing trip aboard the Lady Pamela II in South Florida. Bob fishes with us year after year and has become a friend of the crew. Once we hit the flat calm open water, we trolled south down the reef and noticed no activity. Captain Paul decided to move to a shipwreck where I expertly positioned a bait on the bottom, the bite was nearly instant. A nice size Almaco Jack ate and went in the fish box for Bob’s fresh fish dinner. After a few pictures, we dropped down bait number two and hooked an Amberjack that didn’t give in easily. 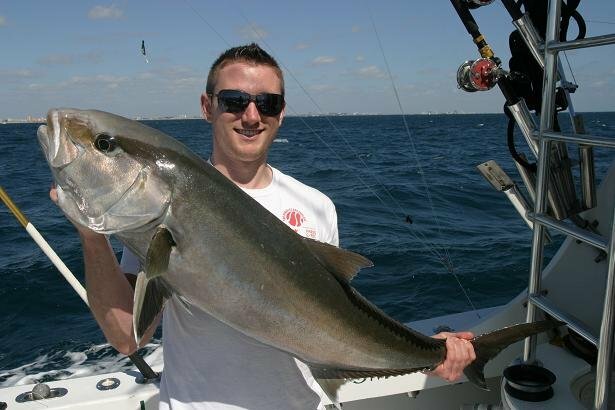 We skillfully released the Amberjack and relocated to do some Big Game Shark Fishing. 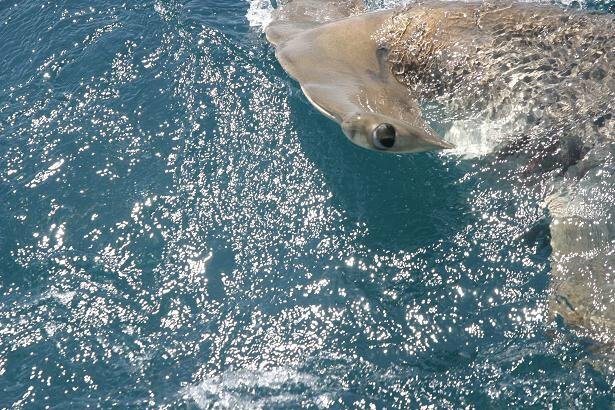 I realize Game Sharks have been the main subject in many of my daily reports, but the large migratory sharks such as Hammerhead’s, Thresher’s and Bull Sharks have really been pouring through the Fort Lauderdale area offshore. Fresh, bloody King Mackerel and petite, whole Bonito fish really tend to turn these marine monsters on. When Captain Paul gave me the OK to bring out the big rods, I rigged up a top bait and a bottom bait. 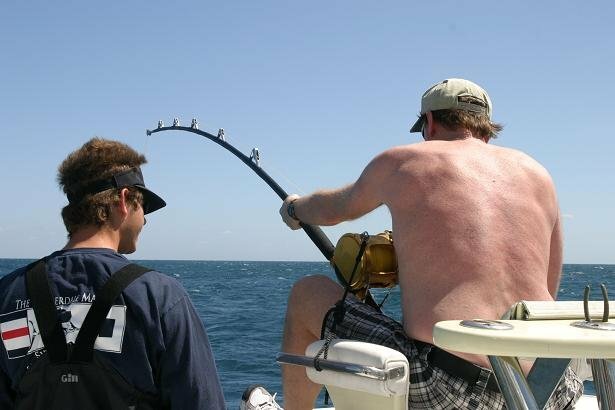 Unlike wreck fishing, the bite wasn’t instantaneous. We were patient for an hour before the rod doubled over and we set the hook. 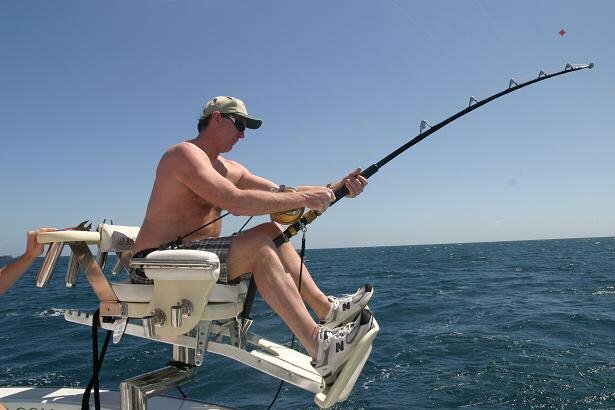 Bob knows the drill, jump in the chair, start reeling and do not stop. 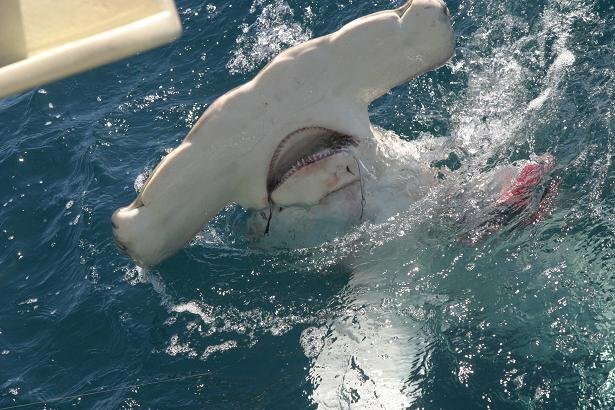 There’s nothing like looking down at a 10 ft Greater Hammerhead Shark with a wicked set of teeth. Once we got the fish to the transom, we carefully placed a head rope on him to get exact measurements for a tag and release. Bob, you are one lucky guy! This afternoon, we left Lauderdale Marina with a group of guys just looking to have a good time while on vacation in Fort Lauderdale, Florida. Our standard trolling spread went in the water looking for some fish to jump on. After a while of fishing and not catching, the gang told us to call it a day and head back. Rather than just cutting the trip short, we asked if we could stop by a few wrecks on the way in and give fishing another try. As soon as they asked to go back to the dock, fishing turned around. We landed a few Bonito fish trolling west and when we reached the wreck, our first pass hooked a double header. We lost one fish and ended the day with a really nice size Barracuda.